Motmots are colorful, long- tailed inhabitants of forested areas with most species concentrated in Middle American countries. Six species can be found in Mexico of which one is endemic to the Pacific Slope. Motmots are generally easy to tell apart from other species and Russet-Crowned Motmot is no exception. There is simply no other bird like it in the area of Banderas Bay. 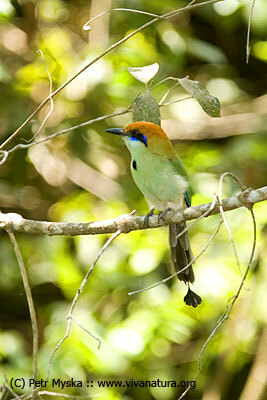 To start with, Russet-Crowned Motmot is a fairly large bird, reaching lengths of 30 -33 cm, tail included. Its coloration is also quite singular, the head and nape are rufous, black face mask is edged violet, upper parts are green and under parts a lighter shade of the same color. Eyes in adults are deep red. The most outstanding identification feature is the bird’s tail. The tail itself is quite long accounting for at least half of the total body length. The interesting detail about tails of all known motmot species is the fact that in adult birds the shape of the tail resembles a tennis racket – long handle followed by a narrow neck section after which comes wide “head”. It is necessary to point out that both sexes of all motmot species posses such a tail shape. To add to the mystery, motmots do not hatch with this particular tail shape – young birds have a perfectly straight, unbroken tail feathers. Why then, do the adults seem to change their mind about its design and decide to shape it into such an exceptional form? Russet-Crowned Motmots can be found in the bay area in the tropical forest habitat and quieter greener suburbs. I have found them a little tricky to spot for the most of the year, but as the mating season commences in the spring, they can be seen and heard very frequently and I will never forget an early morning surprise in the Mismaloya canyon, where 4 motmots regularly spaced on a horizontal branch greeted the sun with their soft hooting.